After getting to grips with some essential grooves it can be time to focus on developing some of the embellishments and variations heard in the playing of more experienced drummers. So in our next level groove series, we're lifting the lid on some of the concepts that you may have heard in the playing of your favourite drummers and offering some ways for you to take your own grooves to the next level. By definition linear drumming is where no two limbs are played simultaneously (don’t worry the linear police won’t stop your gig should this occur) creating a unique and broken sound, often allowing the hi-hat to state its own rhythm when used in the context of a groove. The following examples illustrate some ways in which short bursts of linear playing can be added to grooves. One of the most frequently encountered figures in linear playing is the right/left/foot combination and in terms of time playing this would normally be orchestrated between the hi-hat, snare and bass drum. However, for the figure to be most effective the left hand note played on the snare would usually be played as a ghost note. This figure can be seen in the middle of Example 1. 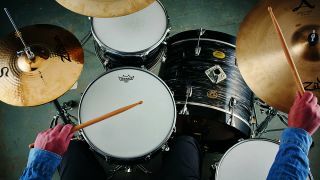 Linear playing often allows the hi-hat to state a rhythmic pattern independent of the bass drum and snare and in Example 2 it can be seen playing the second 16th-note of beats 1 and 2. Example 3 blends some linear playing with a rather familiar sticking in the shape of a single paradiddle on beats 3 and 4. The linear move in the first two beats utilises double strokes to both maintain a steady quarter note but also move the backbeat of 2 a 16th-note earlier. We return to our right/left/foot combination in Example 4, where it’s played from beats 1 to 4. Notice how the hi-hat now states a 4 over 3 rhythm as it scans across the first three beats.